This image shows the giant aircraft that will be used to launch private spacecraft carrying cargo and people into orbit on flights by Stratolaunch Systems, a venture unveiled by Microsoft co-founder Paul G. Allen on Dec. 13, 2011. This story was updated at 3:21 p.m. EST. Microsoft co-founder Paul Allen announced today (Dec. 13) that he is teaming up again with aerospace design mogul Burt Rutan to develop what the pair is calling a revolutionary approach to private space travel for cargo satellites, and eventually people. The billionaire investor and philanthropist unveiled the new company Stratolaunch Systems, which aims to create airport-like operations for space travel. The company, headquartered in Huntsville, Ala., will use a gargantuan twin-boom aircraft to launch a rocket and space capsule on missions to send commercial and government payloads, and ultimately paying passengers, into orbit. The company is aiming to fly the aircraft's first test flight in 2015, with the first operational launch in 2016, company officials said today. Once the launch system is proven to be safe and reliable, manned flights will follow. This image released by Microsoft co-founder Paul Allen's Stratolaunch Systems spotlights the company's giant twin-boom aircraft launch pad for private spaceflights. The giant aircraft will essentially stitch together parts from two 747 airliners, combined with aircraft components designed by Scaled Composites, the Mojave, Calif.-based aerospace design company founded by Rutan. "Paul and I pioneered private space travel with SpaceShipOne, which led to Virgin Galactic’s commercial suborbital SpaceShipTwo Program," Rutan, who will join Stratolaunch Systems as a board member, said in a statement. "Now, we will have the opportunity to extend that capability to orbit and beyond. Paul has proven himself a visionary with the will, commitment and courage to continue pushing the boundaries of space technology. We are well aware of the challenges ahead, but we have put together an incredible research team that will draw inspiration from Paul’s vision." With a total of six 747 engines and a massive wingspan that stretches 385 feet (117 meters) — longer than a football field — the Stratolaunch Systems aircraft is expected to be the largest ever constructed. In fact, the craft's wingspan is even longer than the International Space Station, which extends about 357 feet (109 m) along its main truss. The plane will be built in a Stratolaunch hangar that will soon be under construction at the Mojave Air and Space Port. It will be near where Scaled Composites built SpaceShipOne, company officials said. "This is not a sketch," Rutan said. "It exists in hundreds of detailed drawings, and it's relatively close to [being built] as soon as we can get a building big enough." To deliver payloads into orbit, the aircraft will carry a multi-stage rocket booster that will be manufactured by Space Explorations Technologies (SpaceX), the Hawthorne, Calif.-based commercial rocket company. The rocket will be released at about 30,000 feet (9,100 m), company officials said. The booster will be a derivative of SpaceX's existing rockets, along the lines of the company's Falcon 4 or Falcon 5, said Adam Harris, vice president of government affairs at SpaceX. The rocket will be larger than the Falcon 1 but shorter than the existing Falcon 9, he added. The planned medium-class rocket will have a lift capacity that is roughly comparable to the United Launch Alliance's workhorse Delta 2 rocket, which has lofted a bevy of government satellites and payloads into orbit since the 1980s. Additional design modifications for the rocket, such as the addition or wings or fins, will also be assessed, Harris said. The company is expecting to find a range of customers, spanning the private and public sector. "Obviously [this is a] big initial investment that we wouldn't be making if we didn't think there would be a lot of customers out there," Allen said. "But, you have a certain number of dreams in your life that you want to fulfill, and this is a dream that I'm very excited about to see come to fruition." 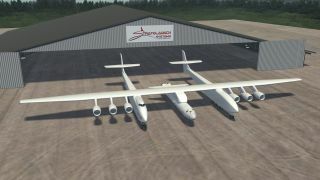 A video still by Stratolaunch Systems indicates their aircraft will possess a gross weight of over 1.2 million pounds. Today's announcement is not Allen's first foray into the realm of private space travel. The billionaire has supported a series of science and aerospace projects over the years. Allen first partnered with Rutan, founder of the aerospace design company Scaled Composites, to bankroll more than $20 million for the construction of a manned vehicle capable of reaching the edge of space. In 2004, the SpaceShipOne suborbital rocket plane became the first privately built manned craft to reach suborbital space. In October of that year, SpaceShipOne was piloted to suborbital altitudes of more than 360,000 feet (112 kilometers) on back-to-back flights that helped Rutan and Allen snag the $10 million Ansari X prize. In addition to financing the development of SpaceShipOne, Allen also funded the construction of a collection of 42 radio dishes for the nonprofit Search for Extraterrestrial Intelligence (SETI) Institute. The Allen Telescope Array, named for the billionaire, is used to listen for alien signals in the SETI Institute's ongoing search for life beyond Earth. Stratolaunch Systems will be led by Gary Wentz, a former chief engineer at NASA. Former NASA administrator Mike Griffin is also one of the company's board members. Griffin joined Allen and Rutan in a press conference today from Seattle to announce the new project. "We believe this technology has the potential to someday make spaceflight routine by removing many of the constraints associated with ground launched rockets," Griffin said in a statement. "Our system will also provide the flexibility to launch from a large variety of locations."